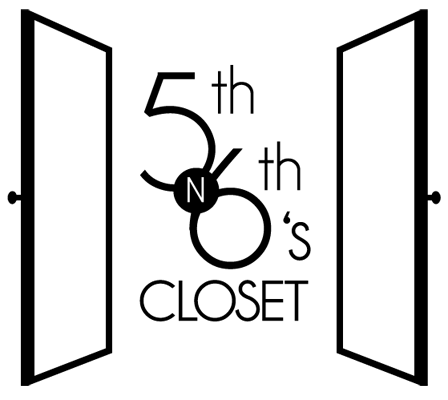 Fifth N' Sixth's Closet: White.....Collar..
Hey guys hope you all had a wonderful week and are looking forward to the weekend like we are! We want to thank Margaret Odetola of Peggyz Place for featuring us on her blog, you guys can check out the post & her blog here. Thank you guys for all the wonderful support & have a lovely weekend! Tommy tee//H&M pants//really old shoe//Prada sunglasses//Moschino watch//Collar necklace// Saks, Macy’s & Ny vendor jewelry. Mide-Miro purse//DSWshoes//Collar necklace// MK watch//vintage earrings//eBay, Saks, Macy’s, NY vendor jewelry//H&M sunglasses. Loving the whites with the POPS of color!!! So trendy!!! Where did you ladies get those magnificent necklaces? I absolutely love these all white looks! nice looks! love those neon shoes! White HOT ladies!!!! I still want one of your necklaces!!!! They are so FLY!!!!!!!!!!!!!!!!!!!! i love you girls and i'm following you on bloglovin! great blog! hi, 5th and 6th! love the crisp white outfits. isn't it amazing what accessories can do? love adding the pop of colors! you guys are just amazing!! llove these two total white looks, perfect for summer! that statement pieces are stealing my heart away ! just wow ! 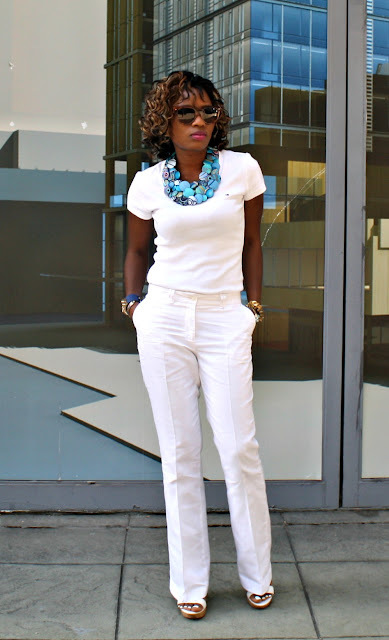 i love summery white outfits...so refreshing here with the colorful accents! White my favorite colour! You both look fantastic! You look absolutely stunning. I adore this on you! Fabulous post! Hello ladies, thank you so much for the lovely comment and for following. I truly appreciate the love. Oh and about me following you guys, I've been doing that for quite some time now haha. Me encantan los collares sobretodo el turquesa. Love both of these looks! The all-white is perfect for those necklaces! Love the neon shoes too! Love the white top and white pants combined. So fresh and perfect! You both look really amazing! I love how you're both in white but with different colored accessories! I love both white outfits! Especially the colorful accessories! ..white must be my favorite colour , especially in Summer , you both look so chic , I love the necklaces - so fabulous ..
You all are brave! Every time I wear white, it's a different color by the end of the day! Those "collars" are truly fabulous! 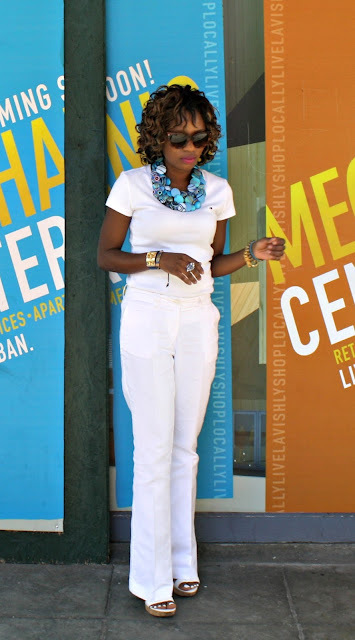 I love the all white and how you focused on the statement necklaces to add color! Both looks are really nice! I'm so in love with those neon shoes. OMG. I die. You both are so lovely and stunning! LOVE the all white look with the POPS of color. LOVE LOVE LOVE it! these necklaces are amazing. such a pitty you di not make details.. I totally adored this post. The white look u have uploaded is just breath - taking and the accessories rock seriously!! 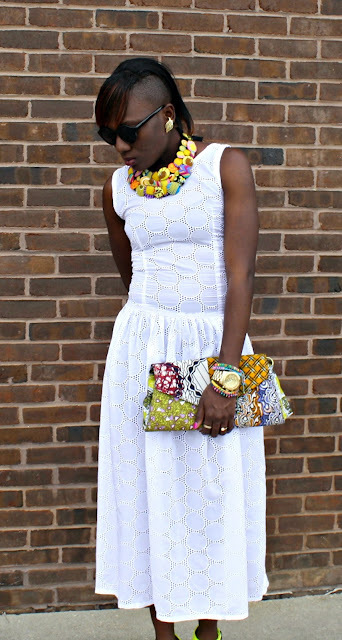 Loving the all white looks + gorgeous colorful accessories! Win a FREE DRESS GIVEAWAY ON MY BLOG!!! O.M.G.! !You girls are from another planet:) A-MAZING! I love these all white looks and your necklaces are amazing!!! Cool post! Love the styles, white outfit and a pop of colored accessories! I totally adore both look, and how you both styled it with a statement necklaces. lovely as always ! and thank you for your comment. Would love to see those necklaces up close, very nice. I love the all white outfits! Love the pops of color using accessories. You both look amazing. You guys look amazing! Love the crisp white! So classy! 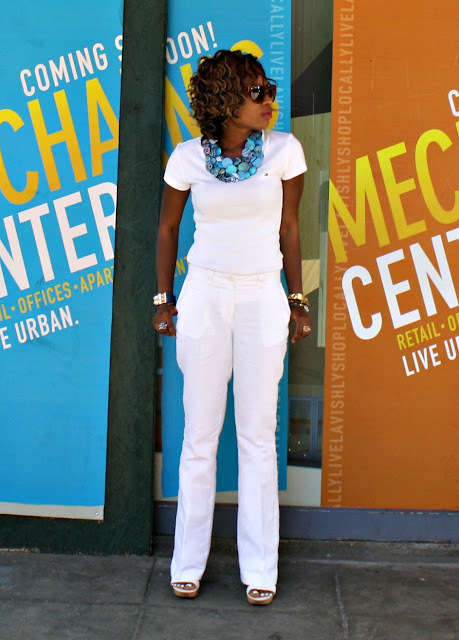 I adore the white outfits with the pops of color! Love both outfits. 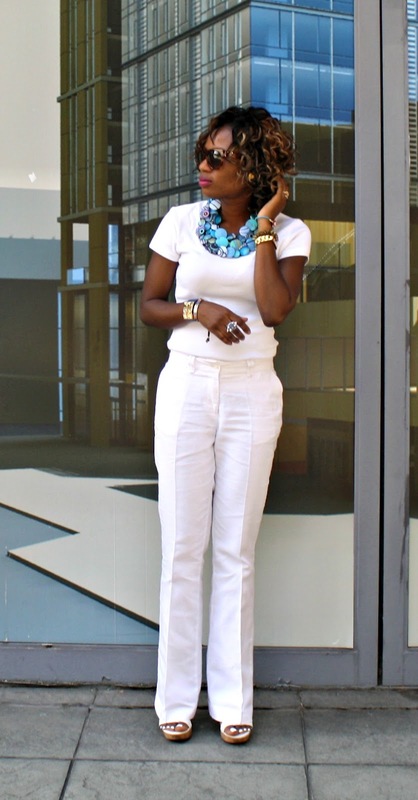 Great idea mixing a total white look with a colour big detail as the necklace in this case! You look great!! you ladies always have the best accessories and definitely know how to make the simplest looks POP. You both look amazing in white! Congrats on your feature, luvs! 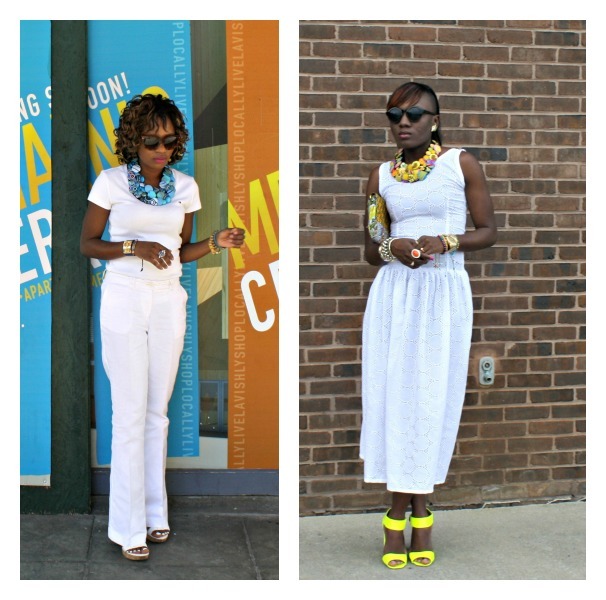 I'm diggin' the all white looks for summer, especially when you add a pop of color like those yellow heels! Loving you ladies in white! Amazing outfits, I'll have to go and check out your featire! Congrats! gorgeous in white! love the neon details, it looks so fab! I am a juge fan of white looks.Great accessories! !Kisse sand have a nice week. wow! this is what I call a MAXI collar! I love the white outfit! these all white looks are fabulous! I'm loving the white! You ladies look fabulous! p.s. I invite you to join "The beauty series" on my blog starting on August 15th. Nine posts long, it will feature guest posts, many pictures, and a giveaway. Waw ! I love your accessories ! Both of you look lovely, Im loving the neon shoes!